Eagle Point Park covers 661 acres of conservation land, 17 of which have been developed for recreational use. It is situated south of where Trouble Creek flows into the Gulf of Mexico. The conservation area protected by the park includes Fillman's Bayou and the wetlands and mangroves bordering the Gulf. The water access from within the park is via two man-made canals that were created in the 1960's ... probably as part of a plan for a housing development. The property remained undeveloped until 2003 when Pasco County gained ownership of the land. A parking area and restrooms are located at the entrance to the park at the west end of Trouble Creek Road where it joins Strauber Memorial Highway. Two picnic pavilions are available as well as a children's playground. Fishing piers are located near the picnic pavilions. And another fishing pier faces Trouble Creek at the north side of the park. A short fitness trail with five workout stations leads from the parking area to the north fishing pier. 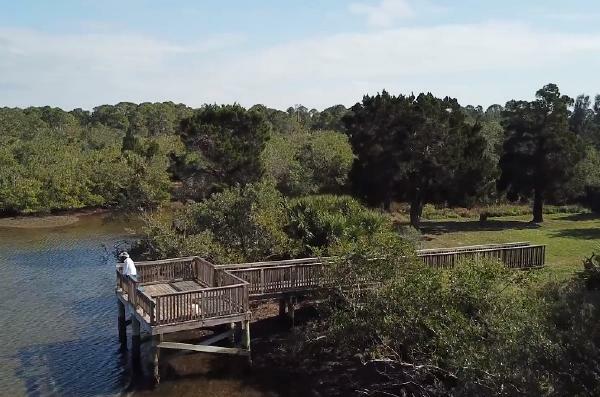 A kayak launch area is located immediately next to the parking area, making this one of the most convenient places to launch kayaks or canoes for access to the Gulf. A sloped gravel launch is available as well as a floating dock and pier. Motorboats are not allowed to launch from this location. The water in Trouble Creek is very shallow at low tide. This is reportedly how Trouble Creek came by its name, when fishermen in times past had trouble returning to their docks and had to pull their boats through the mud. Kayaks should find enough water at all but the lowest tide as long as they stay in the channel next to Gulf Harbors to the north when paddling out to the Gulf. The mangroves along Fillman's Bayou and creek make for an interesting place to paddle and observe the native waterfowl, which can include blue heron, white ibis, wood storks, roseate spoonbills, and others.